Your wedding ring is supposed to be a symbol of commitment, but it’s awfully easy to slip off and put in your pocket. Sure, you might have that telling tan line, but that could easily be explained away as a recent divorce. If you or your spouse need a ring that leaves a more of an impression on would-be paramours then check out the anti-cheating ring. The inside of the ring is embossed so it leaves a mark on your ring finger that says “I’m Married.” The ring is made of strengthened titanium and comes with a lifetime guarantee, because you know, ‘til death (or divorce) do you part. 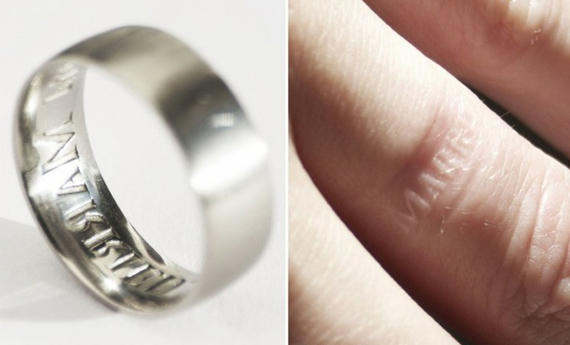 Who wears their ring so tight that it will leave an impression like that? A sad situation if this is what is needed to stop people cheating. Human nature is a curious thing. There are far better ways to live ! !